Lane is moving toward the north-northwest near 3 mph (6 km/h), and this general motion is expected to continue through Saturday morning. Hawaii Island has been downgraded to a Hurricane Watch. Excessive rainfall associated with Lane will impact the Hawaiian Islands into the weekend, leading to significant and life-threatening flash flooding and landslides. Lane will pass dangerously close to the main Hawaiian Islands as a hurricane Thursday and Friday, and is expected to bring damaging winds. A Hurricane Warning is issued when hurricane conditions of damaging winds, damaging surf, and flooding rains are possible within 36 hours. Lane is a powerful category 4 hurricane. 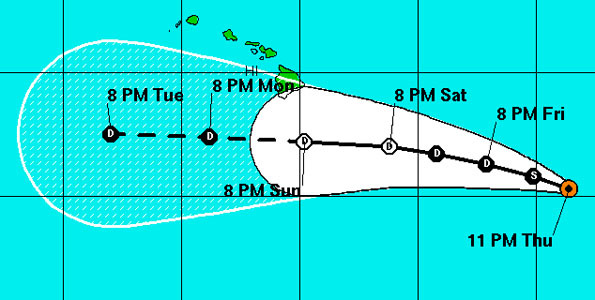 A Hurricane Watch may be required for portions of the main Hawaiian Islands on Tuesday. Lane is forecast to pass south of Hawaii Island this week, potentially causing local impacts as it tracks west-northwestward. As of 11 p.m. HST the center of Tropical Storm Fernanda was located about 1,350 miles East-Southeast of South Point. The National Hurricane Center models show that the storm will not become a hurricane. 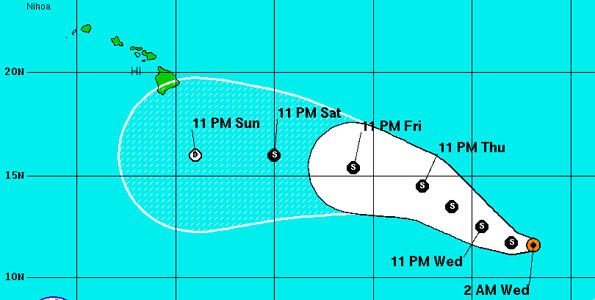 Tropical Depression Lana has passed the Big Island and is about 510 miles South-Southwest of Honolulu. Maximum sustained winds are near 35 mph with higher gusts, some weakening is forecast within 24 hours.